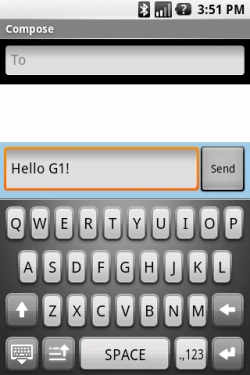 G1 to get virtual keyboard in Q1 2009 | Android Blast! The complaints are starting to leak out about T-Mobile's G1. Some users are complaining about battery time, and others are complaining about the lack of a virtual keyboard. Having to slide the keyboard out every time you want to shoot even the shortest of text messages is apparently a hassle. Having a virtual keyboard could make the G1 a bit more one-handed friendly. According to the Android roadmap, a virtual keyboard could be on the way in Q1 2009.